Published 2011-10-15 in sections English, Debian. 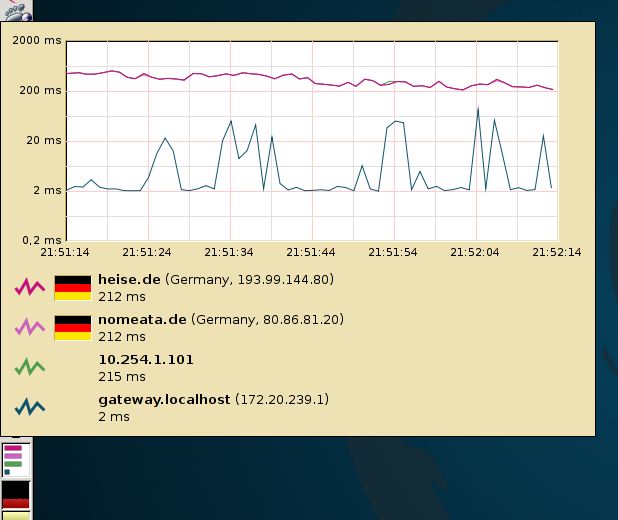 Jean-Yves Lefort’s link-monitor-applet, an applet for the GNOME panel, is a great tool for those with often-changing and possibly unreliable network connection. It allows me to see, at one glance, whether I can reach the router, the internet and/or my VPN. Furthermore, the latency display tells me whether there is a point in working over SSH right now. I often observe other people, e.g. on conferences, to stare for a while at a non-loading web page, then fire up a terminal window and run random ping commands, while I immediately see that the network is down and can relax. Unfortunately, Jean-Yves seems to have stopped working on link-monitor-applet and does not reply to bug reports. This was not a big deal as long as I could use the last released version with minor patches of mine, but now gnome-panel 3 is coming up and all applets need porting to GTK3. Yesterday and today I worked on that, and got it so far that the applet is fully functional, although the visual styling is not perfect yet, because I’m not sure how to do what Jean-Yves did with GtkStyle and GdkGC now with GtkStyleContext and Cairo. The code is in the gnome3 branch of my git repository. For this issue, and any further maintenance work, I’m looking for someone who is willing to take upstream responsibility for link-monitor-applet, e.g. making sure it works with the latest GNOME (well, GNOME in fallback mode) and that bug reports are handled. The code base is not too big, and both the non-standard build system and the gob-enhanced C code are fine to work with. I’ll still be happy to serve as the maintainer of the Debian package of link-monitor-applet. This is the applet that I miss the most on GNOME3 and its basically preventing me moving to GNOME3. I'm very interested in using the new port of it as well. Note that the Debian package version 3.0-5 works with GNOME3. I’m not using it full time, but I think it is about time to upgrade here. If you are not on Debian or Ubuntu, you can pull the sources from my git repository. Any plans to port it to Unity? That's the only thing I seem to really lack in Unity today. I don’t have any such plans, as I don’t use Unity, but I would not object adding such patches to the Debian package.